One Bloody Thing After Another is written by Joey Comeau, a Canadian writer best known for his Web comic, A Softer World. This novel is billed as horror, and although it is not truly horrific, it does possess a rather distinct creep factor. 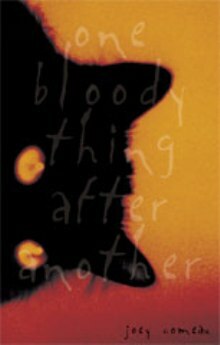 Short and to-the-point, with fast pacing and crisp prose, One Bloody Thing After Another, although a little disjointed at times, is a quick and engrossing read. In turns a ghost story, a teen romance, and a tale of a family gone horribly wrong, One Bloody Thing After Another weaves together the tales of three distinct characters whose lives intersect at odd turning points. Jackie has a knack for trouble and skates a thin line on the edge of crazy. She also has a frightening and frequently useful ability, one that brings her ever closer to her dead mother, and her dead mother’s ghost. And Jackie is madly in love with her best friend, Ann. But Ann has problems of her own. Her mother is turning into something else, something monstrous, something that demands living flesh for meals, and Ann doesn’t know what to do. Even with the help of her sister, she’s barely keeping it together. And then there’s Charlie, and elderly man and his equally elderly and a little bit dim-witted dog, Mitchie. Charlie sees ghosts. Or, rather, one ghost in particular: a girl who holds her severed head in her hands and follows him around every day. He’s not sure what she wants, but he knows she wants something. With the lives and fates of these three intertwined with touches of dark humor, One Bloody Thing After Another is an intriguing, if brief, read. The last line is sure to have the reader laugh out loud, and then feel just a little bit guilty about it.